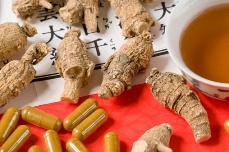 Ginseng has a very long history as a potent herbal medicine. Perhaps some of its acclaimed ability to boost energy, act as an aphrodisiac, and fend off disease is due to the fact that it’s an adaptogenic herb. An adaptogen is special regulator that increases the ability of an organism to adapt to environmental factors — or, in other words, avoid damage from these factors. What sorts of things are we talking about here? Basically, just about everything, from physiological factors such as aging or injury to psychological factors such as anxiety. In a recent study, researchers examined the potential activation and synergism between three common ginsenosides present in ginseng: ginsenoside Rb1 (Rb1); ginsenoside Rg1 (Rg1); and ginsenoside 20(S)- protopanaxytriol (20S). The researchers found that Rb1 and Rg1 are relatively non-toxic to cells, while 20S significantly inhibited cell proliferation. Rb1, Rg1 or 20S also induced what the researchers called “total antioxidant activity.” Combination of 20S with either Rb1 or Rg1 induced total antioxidant activity synergistically — meaning they worked together to produce additional beneficial effects. This, the researchers say, is likely the reason for ginseng’s beneficial health effects such as cancer chemoprevention. If you’d like to given ginseng a try, you can find it just about anywhere now, thanks to its reputation as an energy booster. Many variety stores even have little bottles containing ginseng root right beside the chocolate bars and chewing gum. If you would like to be a little more discerning in your purchase of some ginseng root, it might be helpful to know that “Panax ginseng” is available in different forms. Red ginseng is unpeeled “Panax ginseng” that’s steamed before it’s dried. White ginseng, on the other hand is “Panax ginseng” that has been dried and peeled. Both these types of ginseng are said to exert different effects in the body and are sold in powders, tinctures, liquid extracts, and capsules. Don’t forget to get your doctor’s advice before taking any herbal medicine.